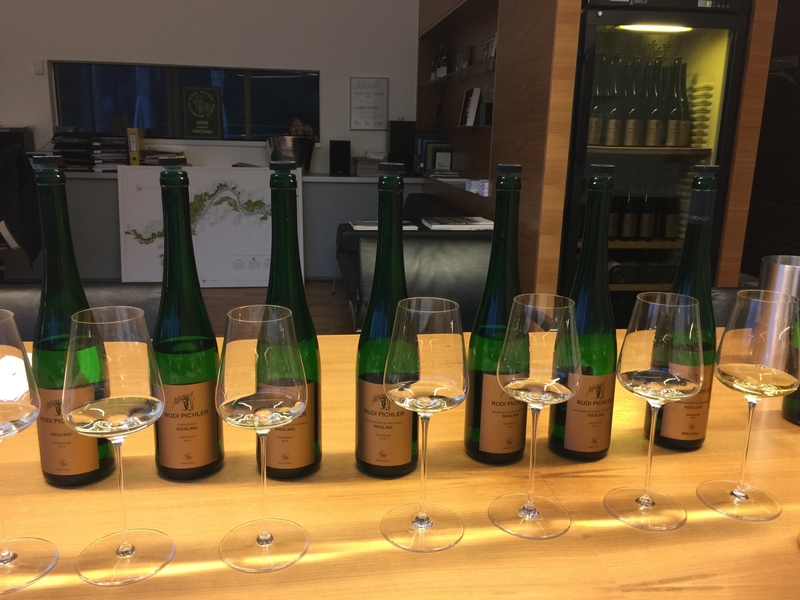 The 2015 Riesling lineup that day with the Steinporz Weissburgunder. 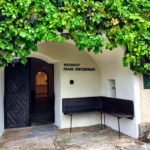 My first ever official wine producer visit in the Wachau wine-growing region of Austria took place at the venerable Weingut Franz Hirtzberger in the cooler section of the Wachau in the village of Spitz. 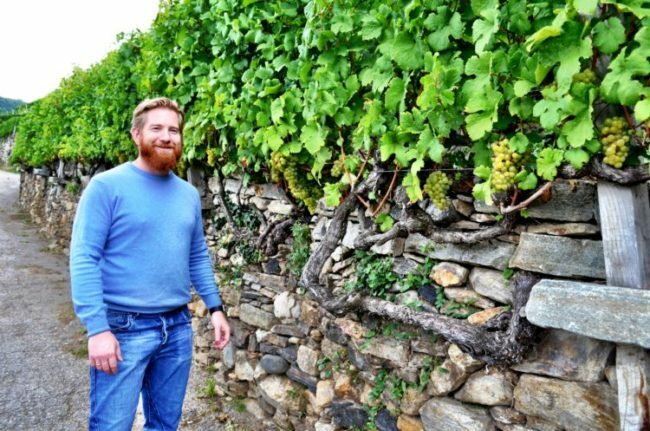 Franz Hirtzberger (Sr.) also happens to be one of the original founding members of Vinea Wachau, the regulatory body of winemaking in the Wachau. 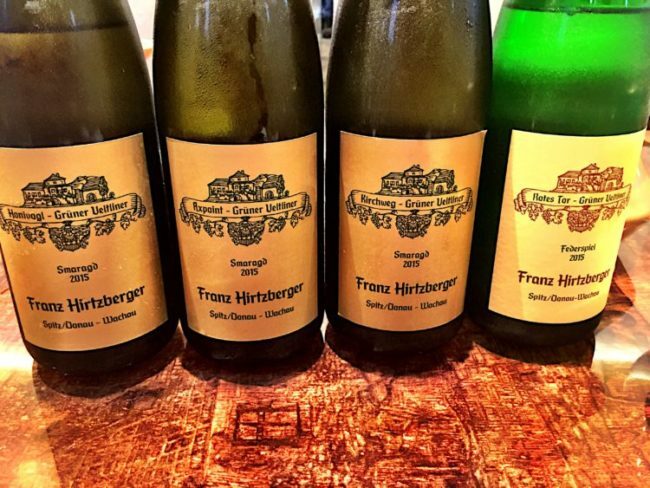 Weingut Franz Hirtzberger was founded by the senior Franz Hirtzberger and is now run by his son, also named Franz. 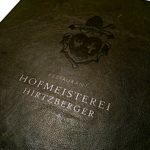 Hirtzberger is one the elite producers in the Wachau that combines a long family history in the region of five generations, excellent wine growing and winemaking intuition and skill, and maybe the most important aspect is the stunning array of vineyard sites in their family holdings: Singerriedel, Honivogl, Axpoint, Hochrain, Setzberg, Steinporz, Kirchweg, Donaugarten, Rotes Tor, Pluris, and Schlossgarten. 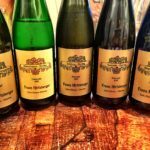 Those are indeed as one might say “The Family Jewels” and one of the best collections of vineyard sites by any Wachau Weingut. The entrance to Franz Hirtzberger. 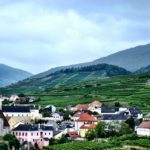 From the road, we see a modest whitewashed building set back from the river near the back of Spitz where the village that ends and the vineyards begin immediately behind the weingut. Once inside the whitewash aesthetics continue in the foyer and on throughout to the tasting room and the separate wine salon. Within each are handsome tables of glossy and polished amber wood. In the salon, the standing room only table has an inlaid map of the Hirtzberger vineyards. 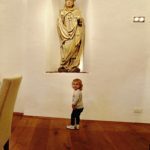 Camille was particularly smitten with the Saint Urban statue in the tasting room set into the wall. 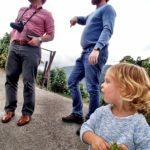 The younger Franz who is now in charge met us when we arrived to taste and show us around. 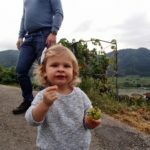 About a year or two younger than me, many of the next generation sons and daughters are now taking over from the elders that started the wine revolution in the Wachau. Speaking perfect English, we made some small talk and headed to the tasting room first to taste as a group that had arrived before us from the UK was about to taste. Hitzberger tasting setup for the day, round 2, Riesling. Zalto spitoons too, great device! 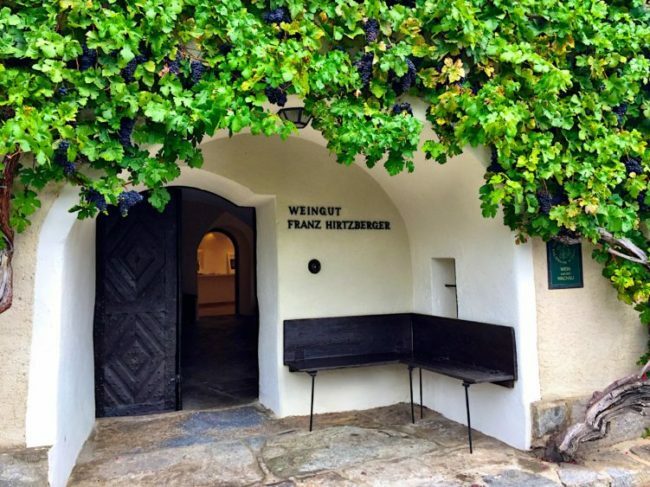 As we tasted through the 2015s we made our way down the line of this epic vintage, all of which was mostly sold out by this time in the Weingut. 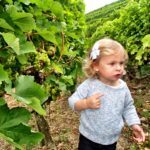 The tasting notes are below at the end and I urge you to peruse them to read for yourself the different terroir expression each site gives as these are truly unique wines, especially in the warm and even growing season of 2015. 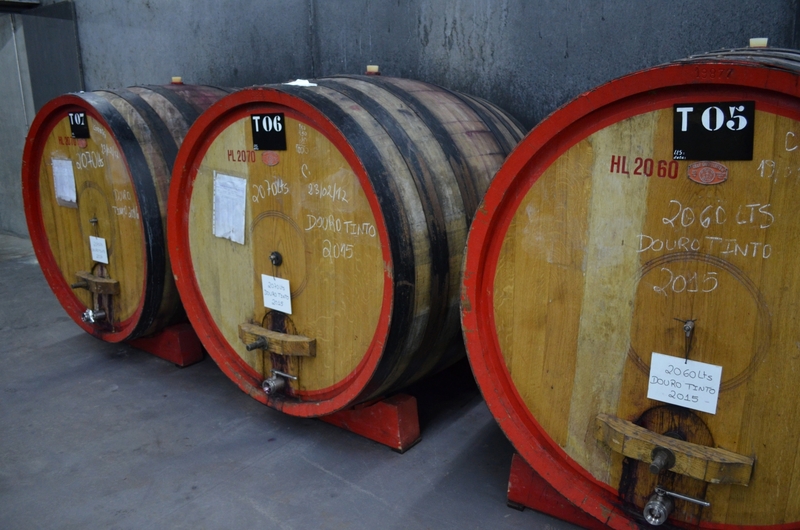 I get the feeling most of these will age for 30 years easy depending on the wine. 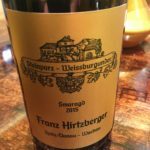 As we made our way through the tasting, it was apparent the style and kind of powerful expression that the Hirtzberger wines are known for in their youth. 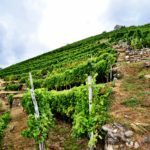 Though some botrytized grapes can make it into the process of making wine in the Wachau, the goal at Hirtzberger is to harvest clean, optimally ripe fruit with underlying freshness from the acidities. 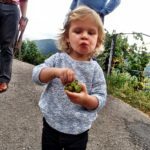 When I asked about how much botrytized fruit is normally included, Franz said none but in the past, it was more common for them and many other producers to include botrytized grapes. This is a producer that has a reputation for including amounts of botrytized grapes so I was surprised but encouraged by that answer. Either way the fruit used to make many of these wines seems to be at the upper limits of ripeness levels. 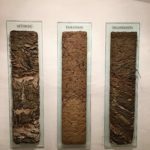 Geology Class: Soil cross sections of Setzberg (gneiss), Hochrain (sandy loam on weathered rock), and Singerreidel (gneiss, mica, schist). We made our way out the back of the Weingut where you are at the foot of two vineyards: Singerriedel and Axpoint. 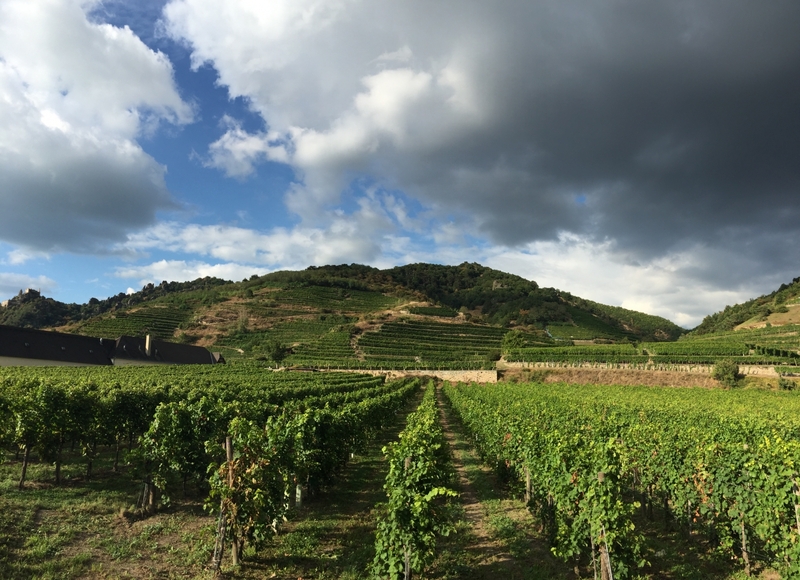 Axpoint is to the center-left with a long fade and a gradual sloping grade up and away from the Weingut. Singerriedel is to the right and we were at the base of the hillside looking up the extremely steep grade. At this part of the vineyard, however, the section is called Honivogl and where the Gruner Veltliner are planted for Hirtzberger. 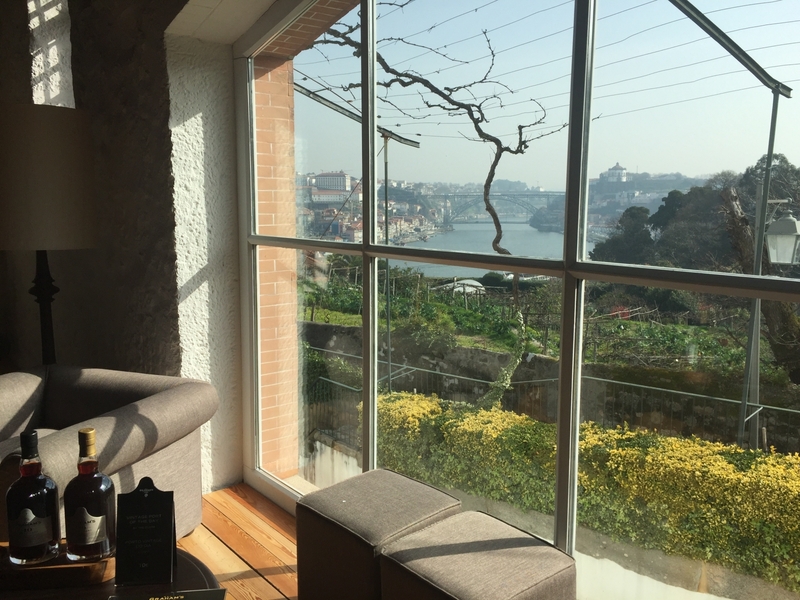 In the Pergola that brings you out back are weaved into the frame Neuberger vines with their sweet and juicy grapes. Franz grabbed a bunch and gave them to us to eat. 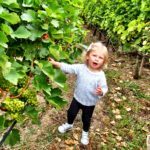 Camille loved them, gobbling down the grapes while in my arms hiking up Singerriedel and walking amongst some of the rows of Riesling vines. 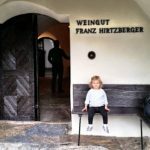 Franz Hirtzberger is now in charge and is the son of Franz Hirtzberger, the namesake of the Weingut. 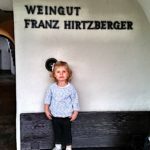 I learned a good deal about vine age regarding the Wachau from Franz. 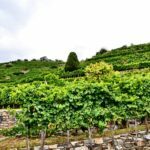 Many of the vines in all the best sites are only about 25-40 years old and are very rarely older than 50 in all of the Wachau. 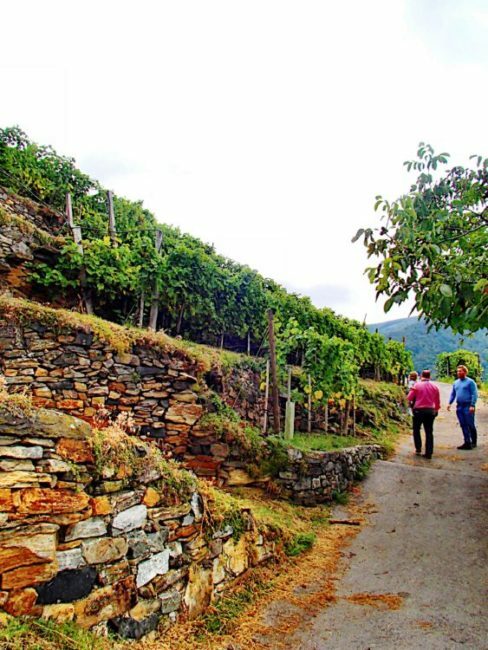 He explained to me it is this way because that is about the time the enlightenment occurred in the Wachau for quality viticulture and winemaking. Everything changed about 35-40 years ago to higher quality viticulture; how the vines are planted, tended, and harvested, all to allow the winemaker to express the vineyard site. 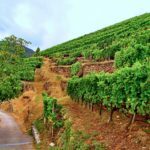 Thus, most replanted or planted anew around this time so therefore you don’t see many vines older than 40 years of age, though they do exist. 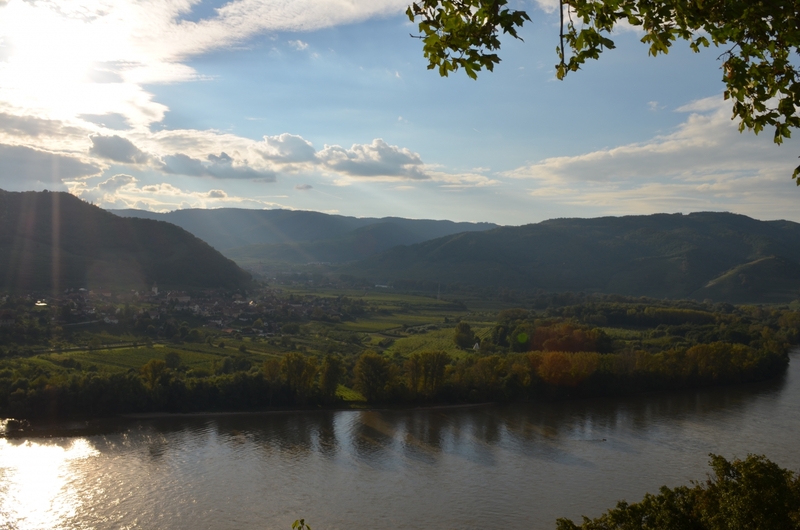 Ried is the equivalent of a Grand Cru vineyard site in the Wachau. 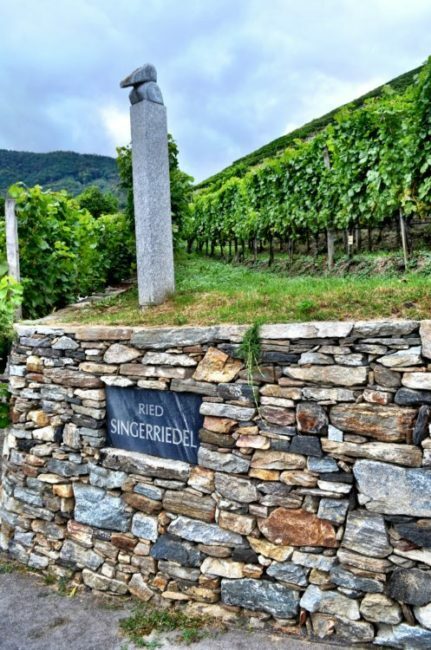 Singerriedel is one of the best for Riesling in all the Wachau. Ried Singerriedel in all its glory! Franz, Camille and I walking up Singerriedel. 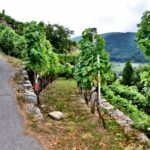 The steep grade up the face of Singerriedel, a grand cru Wachau vineyard site (Ried). 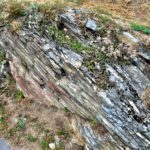 Hard rock gneiss is what most of the Singerriedel vineyard is composed of. 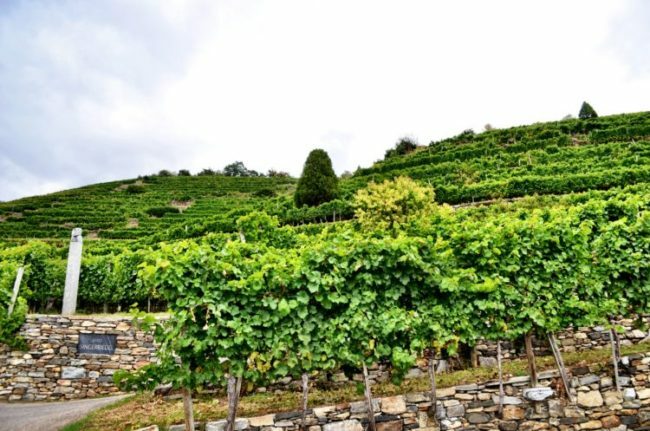 Singerriedel is a gorgeous hillside set perfectly off from the Danube river. 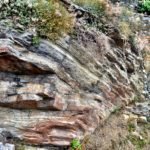 It is extremely steep, with hard rock gneiss, mica, and schist bedrock, exactly the kind of soil the Riesling thrive on here in the Wachau. Funny enough there is also a Hochrain vineyard here, which is a section of Axpoint with a high gravel concentration. The same name for a vineyard exists in the next village east in Wosendorf. 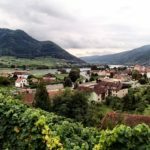 We only made it up about one-third of the way of Singerriedel, where we were rewarded with another beautiful view of the Danube river and the town of Spitz. From here Franz was also able to show us a few more of their vineyard sites and those of a few other producers nearby. Its mind boggling to think that harvest workers will be hiking amongst this site during harvest. 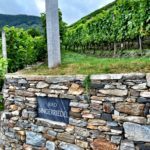 Many of the sites all over the Wachau are like this and are part of the reason why so much work goes into making these wines. 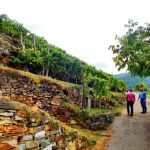 In fact, since many vineyard sites are so difficult to work, tend and harvest, it is common to spot abandoned vineyards in most villages. Maintaining the terraces takes a lot of time, effort and money to maintain, therefore in many cases making some of the sites economically unrealistic. 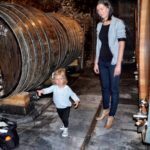 We made our way back down to the Weingut and chatted more about the handing over the reigns to Frank from his father. 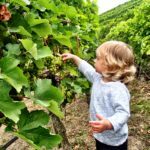 Franz has been helping his father for as long as he can remember and also has gone out in the world to make wines in other regions after getting a degree in enology. This is so important as the best winemakers in the world also taste other great wines of the world. 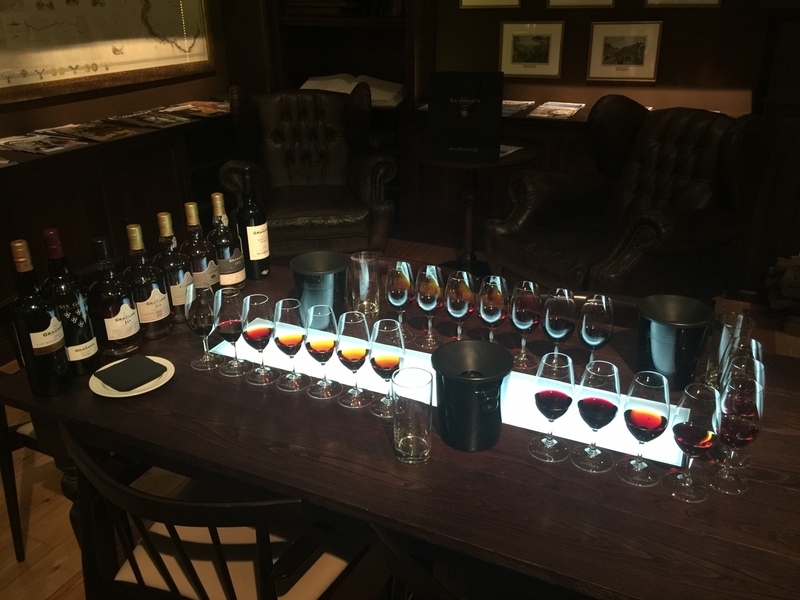 It is important to know your own wines, but maybe even more important to keep tasting wines from abroad to have a consistent and steady comparison of your own wines to the greats from around the world. 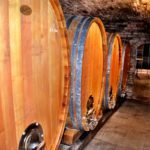 We took a quick look in the cellar and caves where the oak barrels for the Gruner Veltliner and the acacia barrels of the Riesling sit, waiting for wine to be placed in them in a month or 2 once harvest commences. 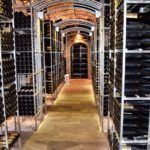 Deep in the cellar are ornate metal racks holding pristine bottles of Hirtzberger going back deep into the family history, mostly for family and special occasions. There also was a table where other winemakers would leave bottles of theirs to swap with Franz as a kind of tradition it seems as there were well over 40 bottles scattered about on the small table from across the winemaking world, Burgundy, Barolo, Mosel, Bordeaux, and Champagne to name just a few. 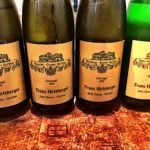 Franz’ brother and family also recently started another Weingut called Hofmeisterei with a heavy focus on a great restaurant that we later enjoyed that evening for dinner. The setting was quite a big space and allowed us to dine amongst parties large and small there to celebrate another great day with traditional Austrian cuisine with a modern sensibility. We also were able to taste through their wines of Hofmeisterei, which showed a different sense of style from the Franz Hirtzberger wines. The wines were delicious and perfect with the food as they seemed to be earlier drinking, charming wines, with a sense of elegance and purity. 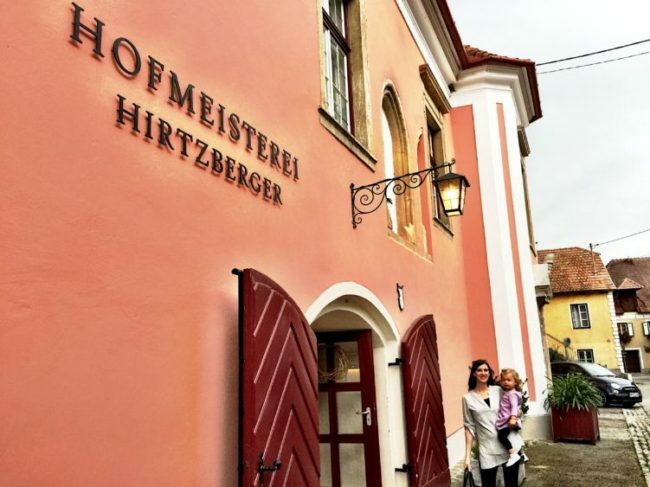 Hofmeisterei Hirtzberger, one of the best places for a traditionally prepared meal in the Wachau and where you can taste the current and back vintages of both Hirtzberger wines. Some of the wines from that day I purchased were not ready so Franz stopped by at dinner to drop them off and say goodbye one last time. 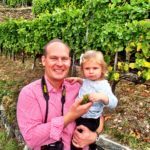 I recently saw him again at Rieslingfeier in New York and we caught up some to fill in some holes for this article. 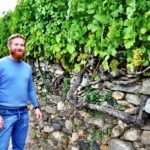 I asked about the 2016 vintage and Franz said that what they harvested was quite good, it, unfortunately, was smaller from frosts by about 40% of a normal crop. So, while we have 2014 (good) and 2015 (excellent) in the market now, the small, but good to very good 2016s will hit the market very soon. 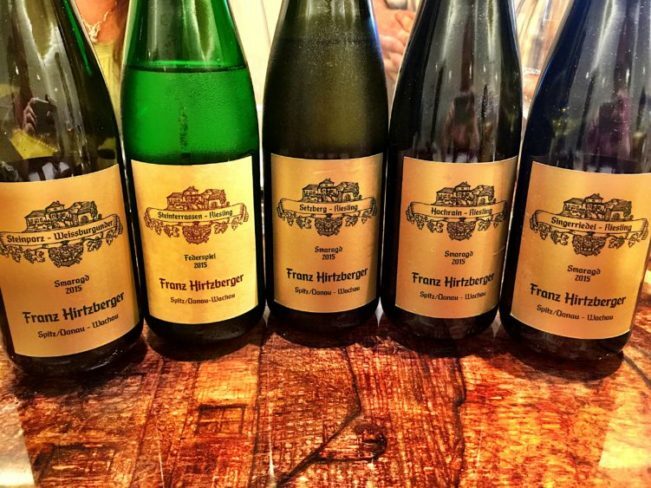 If you are curious about the exceptional quality and tremendous depth that Gruner or Riesling can attain, I suggest you find some of these wines as they are a reference point for the region. 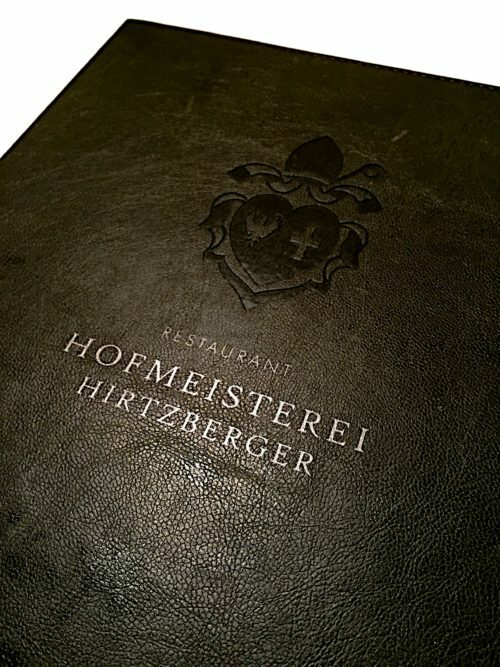 If you are in the Wachau, I definitely suggest you visit here and dine at Hofmeisterei. Rotes Tor is the equivalent of a Spitz village level wine. Fruity and more straightforward than the single site wines, we do get good fruit notes of citrus, apples and pear that has lean to medium body density with good freshness and focus. This part of Kirchweg is wide, with mid-weight soils of brown gravel bedrock, mixed with loess topsoils. The nose here shows hints of wax, apple and pear, and are tightly wound with fresh acids and minerality. The name for this vineyard comes from Abbey Point, or in the local dialect, it was Abts Point which belonged to the local Abbey. 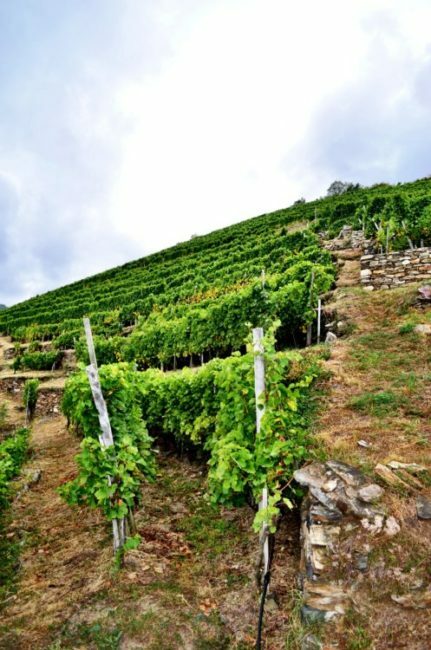 The vineyard was planted in 1996 and lies right out the back of the Weingut, grading up and away from the Weingut on a moderate slope. Medium gold in color, the nose shows lemon and lime citrus oils, honey, and then a light peppery spice note. There is a density and viscosity in the palate, medium+ bodied and plenty of length in the finish. From deeper mineral soils, the Honivogl is the most complex and powerful GV in the Hirtzberger lineup. Deeply complex and layered, the aromas rise from the glass with ease and clear, precise density. The nose and palate peel off with ripe lime, peach and pear, a mellow spice, quite a vibrant nose and palate. A deeply fruited and ripe nose, glossier white and yellow citrus and orchard fruits. Good cut from the acidity, with juicy and ripe pear and apples. Perfectly balanced and complex, this might be better suited to drink now. 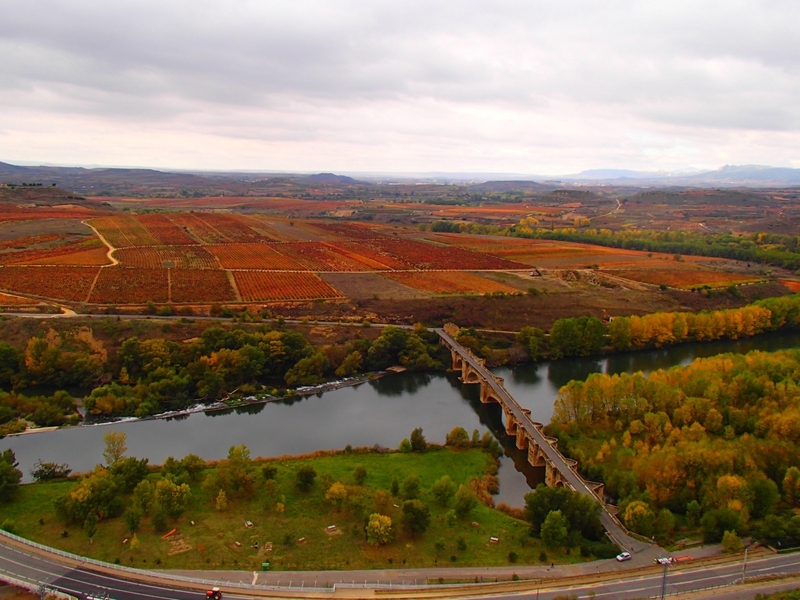 From multiple plots, made up of 90% Smaragd grade vineyards. Savory lime and elegantly persistent florals, minerality and tension, feels extra dry and tense on the finish, mouth-watering acidity. 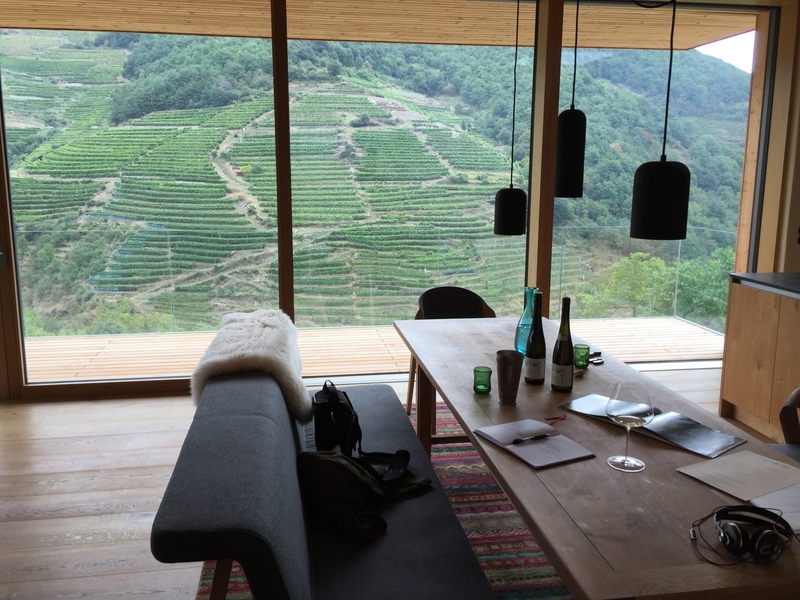 The highest elevation vineyard for Riesling that Hirtzberger owns at (400m). Aromas of citrus fruit and zest, allied with warmer, but not as pronounced stone fruit, with mineral and elegance that is an expression of this cool site. Richer, fuller bodied expression from this small sub-section of Axpoint that is rocky and more fertile than the other Hirtzberger Riesling sites. 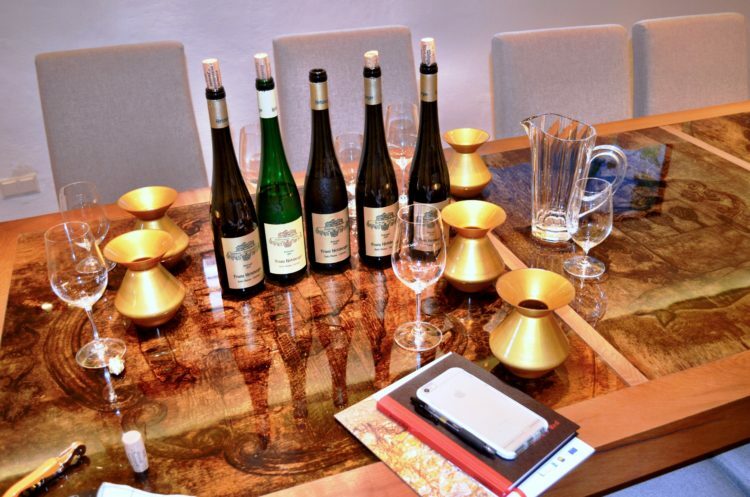 Golden and ripe fruit are Auslese-like, savory, concentrated flavors. A very long and deeply flavored finish that finishes fresher with minerality and acidity. Perfect, exceptional balance and harmony, start to finish this is perfect in every way. Apricot and peach, wildflowers, a subtle savory and mineral core feed off the nerdy of the wine’s fresh and powerful acidity. 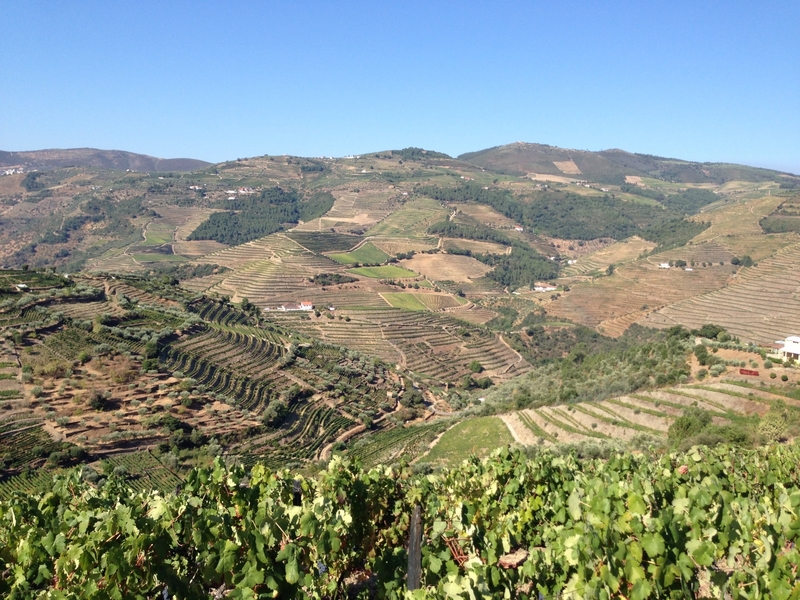 The minerality and density feed into a long, clean and powerful finish. 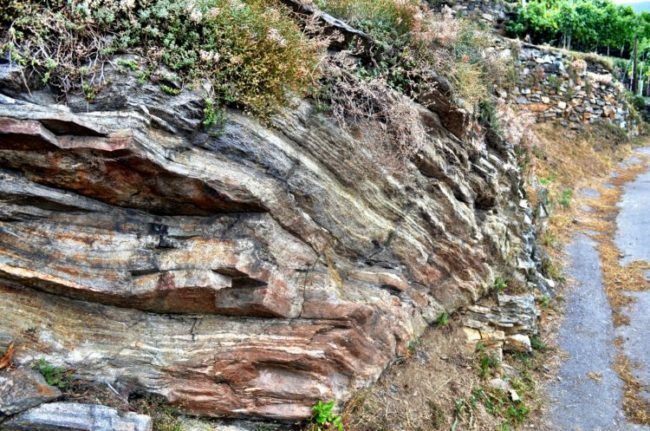 The soils here are hard rock gneiss with a deeply pitched slope facing south not far off from the river. 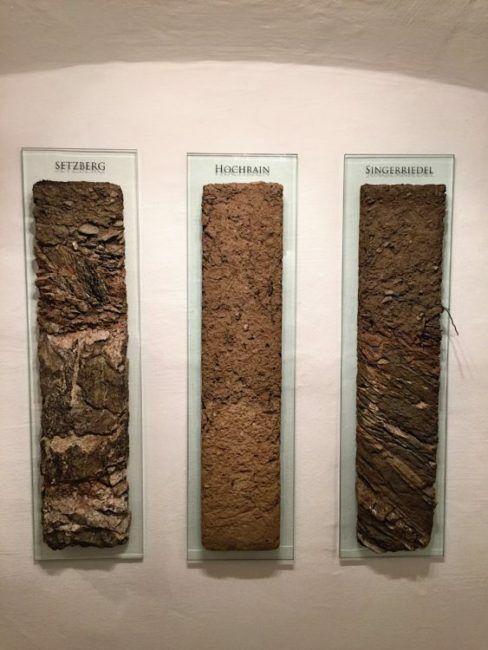 Geology Class: Soil cross sections of Setzberg (entirely gneiss), Hochrain (sandy loam on top of weathered rock), and Singerreidel (gneiss, mica schist). Wood tanks for the brief aging. 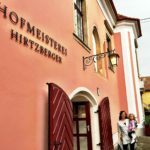 Hofmeisterei Hirtzberger, one of the best places for a traditional, classically prepared meal in the Wachau and where you can taste the current and back vintages of both Hirtzberger wines.